Proper nutrient balance is practically nonexistent in our diets today, and we pay for it in the resulting fatigue, weight gain, and disease. Several factors contribute: First, farming practices and processing methods rob foods of the vitamins, minerals, enzymes and probiotics they once contained. Then, foods high in refined sugars and flour, and the many pre-packaged and fast food meals we consume are devoid of needed nutrients. Add to that the fad diets, the many times we have to eat on the run, and the constant stress we encounter, and it's no wonder our bodies are starving for nutrition. 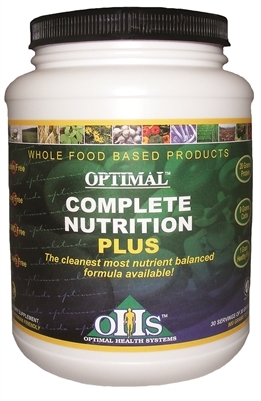 Optimal Complete Nutrition Plus is the most advanced and powerful whole food formula ever developed. Optimal Complete Nutrition Plus is the first and only protein rich whole food powder to combine gluten free, dairy free, soy free and GMO free carbohydrates, proteins and essential omega fats into one formula. All foods are sourced for purity and nutrient density. When the body is under stress from either exercise, disease, or life in general, muscles are depleted of specific amino acids. This amino acid depletion is very detailed and complex. This powder contains the most balanced amino acid profile ever created based on the needs of muscle from stress and exercise. Optimal Complete Nutrition Plus has combined 9 different protein sources in specific amounts to ensure the protein profile your muscles need for recovery and strength are met. The proteins come only from Organic Ancient Grains and antioxidant rich, certified chemical/pesticide free fruits and vegetables. This ensures that you are getting pure unadulterated GMO free nutrient dense foods that deliver health to the cellular level. Carbohydrates come from over 35 vegetables and fruits that have been specially cultivated to provide powerful pure complex carbohydrates to fuel the body. No maltodextrin or processed carbohydrates are in this formula. Optimal Complete Nutrition Plus contains only phytonutrient and antioxidant rich foods! Optimal Complete Nutrition Plus has over 15,000 TOTAL ORAC units of antioxidant protection per serving. New Brunswick Laboratories and independent human clinical studies prove that the special antioxidant blend in this formula neutralizes ALL 5 FREE RADICALS, including the inflammatory response and peroxide formation from stress on the system. Healthy omega fatty acids come from organic flax seed powder. This provides great benefits for the skin and heart while encouraging processed fats that lead to obesity to be removed from the tissues. Optimal Complete Nutrition Plus is sweetened with Stevia, organic fruits, Xylitol from Birchwood and raw vanilla. NO synthetic or artificial sweeteners are used. MADE IN USA. INGREDIENTS: Brown Rice Protein, Organic Ancient Grains blend of Amaranth, Quinoa, Buckwheat, Durum, Millet, Spelt, Barley**, Chia, Banana, Flax Seed, Green Extract, Broccoli Sprout, Green Tea Extract, Onion Extract, Apple Extract, Acerola Extract, Camu Camu, Quercetin, Tomato, Broccoli, Acai, Turmeric, Garlic, Basil, Oregano, Cinnamon, Elderberry, Carrot, Mangosteen, Black Currant Extract, Blueberry Extract, Sweet Cherry, Blackberry, Chokeberry, Raspberry, Spinach, Kale, Bilberry Extract, Brussels Sprout, Natural Vanilla Flavor, Mango, Pineapple, Stevia, Carrot, Alfalfa Sprout, Radish Sprout, Beet, Sunflower Lecithin, Citric Acid. **Barley is certified gluten free. DIRECTIONS: As a dietary supplement, add 1 scoop of powder to 8 ounces of almond milk or your favorite juice and mix with a blender or shaker bottle then drink immediately. For an extra thick and creamy snack, mix 1 scoop in a blender with ice and your favorite fruit.